This small playground is set just near the beach and right next to the skatepark so together they make a good destination for multiple ages. You can’t see the beach from the playground or skatepark but you could keep your eye on a child at the skatepark and the playground at the same time although it would take you a few seconds to run between the 2 if you needed to. The playground has a nautical theme with a full size boat being ‘towed’ by a tractor both of which can be climbed on and in and driven. There’s also sand play equipment at the back of the boat. 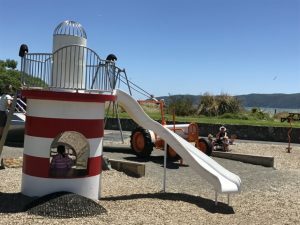 There’s a lighthouse for climbing up with a slide coming out of it. There’s also a spacenet, a 4-person seesaw, Rocktopus and spinning seat. The skatepark is a good size with the usual ramps of varying sizes, rails, table tops and a bowl. There are paths going all along the waterfront so you could potentially park further away and skate or scoot down to the playground. There are toilets near the playground and picnic tables. There isn’t much shade around either the playground or skatepark but there are some trees on the grassy areas. Address: MacLean Park, Marine Parade, Paraparaumu Beach. 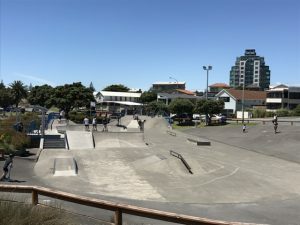 There is parking on the main road but also small carparks near the beach accesses all along Marine Parade if you want to scoot/skate/ride or walk before playing.